"This healing . These small seeds that I have planted tenderly. Cared for. And watched their growth flourish day by day. Have sprouted like a wildflower. My internal seeds. The veins bleeding predominantly through my once jungle inhabited dwelling place with tattered leaves. Leaves that have grown into an embodiment of a strong eucalyptus tree amidst the windy, foggy breeze. Every seed I have planted. Seen or through the unseen.. A thought. A action. A deed. Folds gracefully out the seams with a palm opening up like a lotus flower waiting to be held. In thirst for love. To hold my heart. To hold you heart in every facet of your unique and crazy beautiful being. As the universe holds the earth with its palm face up. With no expectations. Pre-judgements. Just to BE. Be nurtured. Be the nurturing. And nurture the unseen. See, there once was a pile of shoveled dirt swept underneath the welcome mat of my home. My heart that an old lover stomped on all over with his construction boots.. I am continuing to reclaiming home. I am back to my true home. I looked and observed my suffering for a long time. Not knowing how to put the soil's disheveled sedimentary dust back together. Instead, I took a broom and brushed it away as a sailor leaves home and drifts into the unknown. Reclaiming my home. Reclaiming my peaceful power of endless pursuit. I got back in touch with what TRULY makes my heart sing. One of those passions is ... surfing in the deep blue sea . I swam and surfed in the Indian ocean. I returned , rested back to my motherland, the east coast where I reconnected with my dearest loved ones. The ones who have stood by my side through it all as I do the same for them for eternity. So, I said my farewells to the Atlantic Ocean, and flew over to the pacific. The pacific ocean brought a part of my being and a new spirit of playfulness that I left behind when I was in "love." Intoxicated in a luminescent, blinding lust. Thank you Cowells Beach, La Jolla Shores, Davenport, Tourmaline Beach, and my surf sisters. Unseen healing that only our divine, mother ocean can do for one going through a trans-formative journey... Mother ocean. you bring out the Queen Bee in me. The stillness and holding of space in me. You never cease to amaze me with the immense patience, empowerment, wave of resilience , and strength you continuously bestow in me. Since I was 12 yrs old, which is the age I first rode on a longboard my relationship with the ocean, with water, continues to evolve like fine Sonoma Valley wine. You, dear mother ocean, I know you are going nowhere. And neither am I. So please help hold space for me to remain patient... I will set sail through your vistas and paddle out for as long as I live with 2 wide open arms for you and others that set out to shore. What makes you love unconditionally? What ever that is for you and may be, do it . Grasp it firmly like you're holding onto every meticulous grain of sand found on the ocean floor. And , do it with every vessel carrying love to your beating heart. Embrace. Nurture the unseen. Sending you waves of love." current place I reside: Sedona, Arizona. 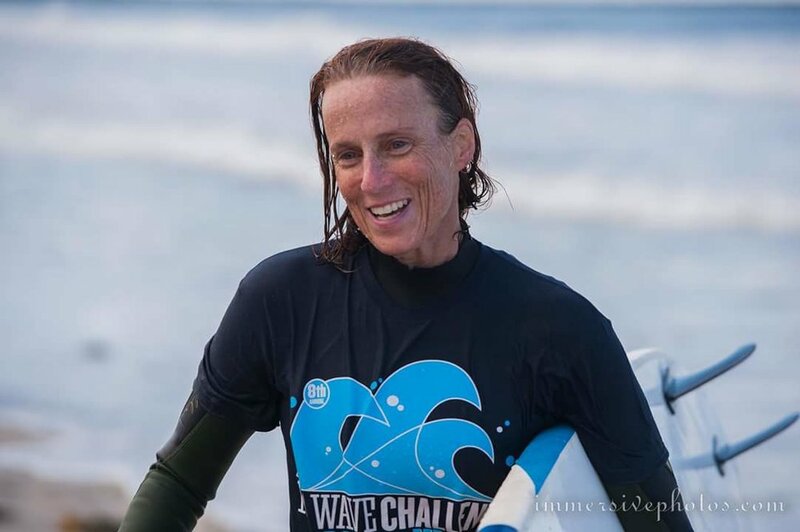 A surfsister’s story of how surf therapy helped in her recovery from Bulimia to a deeper honor and respect for Her body: mother ocean’s and her own. Surf has taught me: (1) learning happens in stages, you have to be patient with yourself. (2) The more inside your head you are and the less you trust your gut, the more likely you are to screw up the decision. (3) Fear and doubting yourself are usually the biggest reasons for failure and not your actual abilities. (4) It is nice to just sit and watch the ocean, enjoy the times when you are forced to relax. "Surfing is Love...is Life..Is Everything"
My husband and I made a pact that we would include her in our travels and that we would not slow down our exploration of the world.